Dry Aging is rarely performed anymore but is the best way to naturally tenderize beef as well as concentrate the natural flavor. It is completely different process and much expensive than common wet aging. At El Pinto Restaurant we dry age all of our Tomahawk Ribeye Steaks for over 30 days. 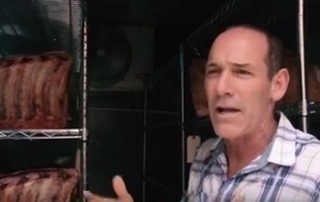 In this video owner, John Thomas, takes you behind the scene to see where we dry age our beef before we hand trim them into Tomahawk Ribeye Steaks. El Pinto dry ages all of its Tomahawk Ribeye steaks on premise for 30+ days and then hand trims them to perfection. Dry aging steaks naturally tenderizes the meat as well as creating a distinct mouth watering flavor. Get a glimpse in the kitchen at El Pinto as they prepare one of their exclusive Tomahawk Ribeye Dry Aged Steaks. 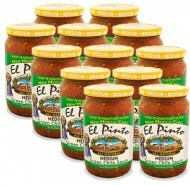 Learn how El Pinto grows it's famous chile in Hatch, New Mexico. 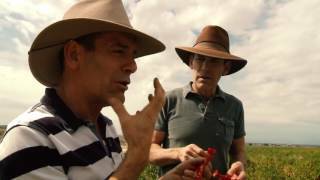 Watch the Salsa Twins, Jim and John Thomas, visit their exclusive El Pinto chile fields and learn what makes El Pinto chile unique. It is grown without any herbicides, pesticides, or fungicides.